I don’t exactly do art tutorials, but I am trying a loose approach to it and sharing a few tips plus the supplies I use. 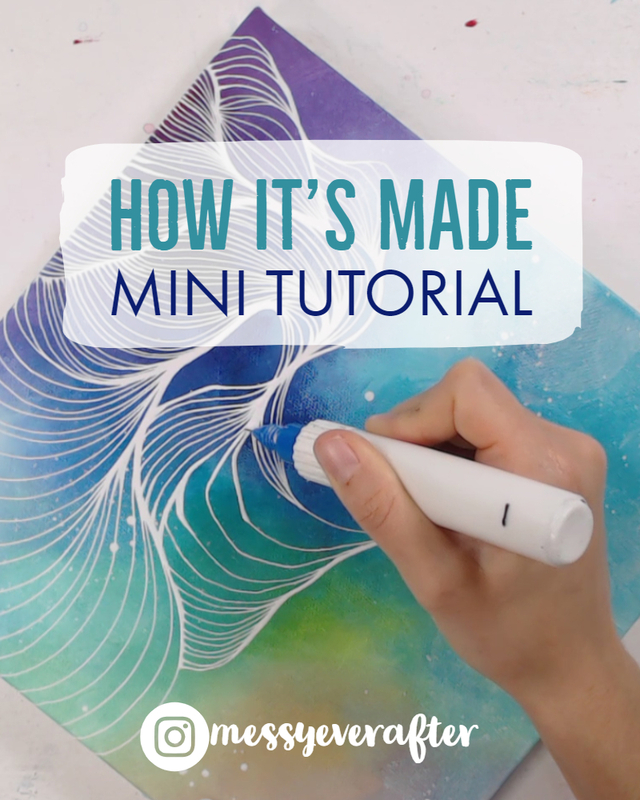 So check out how I made this rainbow swirly piece below! *Links contained in this post are affiliate links and I will earn a commission if you make a purchase within 24 hours of clicking. These are products I use regularly and absolutely love. Varnish: Liquitex High Gloss Varnish (Blick Art Materials or Amazon) and a cheap foam brush. This is by no means a complete tutorial, and your end result may not look exactly like mine, but this will give you an idea of my process. Start with white acrylic paint and a little bit of Teal or Lake Blue with a 1″ brush. I do not add water to my paint initially. Work in small sections with light pressure on the brush. If you see too many brush strokes, you’re pressing too hard or you need more paint. Cover the whole canvas. Let your brush strokes be a little messy. No need to blend the white and blue completely. Let the light base blue layer dry. Switching to the 1/2″ brush gradually add small amounts of darker blues, and then violet. Add a little white to create natural transitions between your color layers. I just dab a small amount of my next color on my brush If your paint gets too dry while working, give your canvas a spritz with water. If your layers get too dark, add a little fluid white mixture to your area to lighten it up. After your blues and violets, add a little green in the middle and continue blending. Continue to spritz the canvas with one or two sprays of water as you work. Then add a drop of yellow fluid acrylic on your brush and work it into the green. The Golden fluid acrylics are highly pigmented and you only need a small drop while working. Bring the yellow downwards and blend into white. Then introduce a small drop of Quinacridone Magenta and blend together to create the light orange color. Add more magenta on the edges and near the violet. Work in more white between layers for that natural blend. Use small amounts of paint at at time. Blending takes patience and practice! Once your base layer and white wisps are dry add your splatters. Using the fluid white mixture and a dry brush (I use a really coarse bristled brush), dip and flick white paint on the edges so it creates a splatter effect. You can also dip your fingers in the paint and flick, or hand draw each dot with the Fineline Precision Applicator. To fill your Fineline Precision Applicators, take the the Brea Reese Titanium White paint and squeeze a little into the bottle. I usually fill it about 1/3 full. Then, add a little bit of water to the bottle. Start with a a few spray bottle spritzes. Then put your thumb over the opening and shake the bottle vigorously. Then put the cap on and try squeezing some paint out. If the bottle is too hard to squeeze, add a little more water and repeat. If paint falls out of the applicator tip without squeezing, your mixture is too thin and needs more paint. Then, start doodling. Try practicing your lines on a piece of paper with pen or pencil and then trace the lines with your applicator until you get used to the tool. It takes practice and your lines may be shaky at first. Once you are all finished, let your work dry and then add two layers of Liquitex High Gloss varnish to your work. And that’s all! If you enjoyed this little tutorial and want to learn more, let me know through Instagram or Email, or consider becoming a Patron of mine (See details below!) Now go get messy and share your creation on Instagram using #messyeverafter! A lot of artists don’t like to share their secrets, but I’m an open book. If you enjoy the content I create and the advice I give to other creators, please consider becoming Patron of mine on Patreon. Pledging as little as $1 a month supports this content and my career as an artist. Previous Previous post: Should You Watermark Your Art Online?